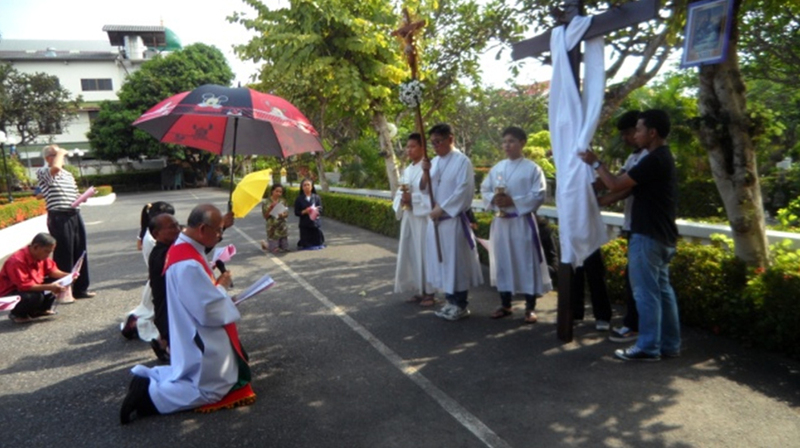 At Roman Catholic St. Nikolaus Church in Pattaya, Easter week is always a special time. It starts with Palm Sunday, the day when Jesus Christ was enthusiastically welcomed in Jerusalem by thousands of people who all carried palm leaves in their hands. At the Sukhumvit Road church, palm leaves were blessed and given to believers to take them home and put behind a cross. Believers walk around the church to conduct the Via Dolorosa. It then goes on with Maundy Thursday, when during mass the traditional foot washing takes place. This ceremony is based on the belief that Christ washed the feet of his disciples after the last supper a before he was crucified. It is a symbol for humility and service to mankind, an important duty of priests. Pope Francis this year washed the feet of women, something that never happened before. On Good Friday, the day Christ was crucified, St. Nikolaus parishioners performed a “via dolorosa” led by Rev. Philip around the church and carried a big cross with them. On all its 12 stations the cross was erected and people knelt and prayed. 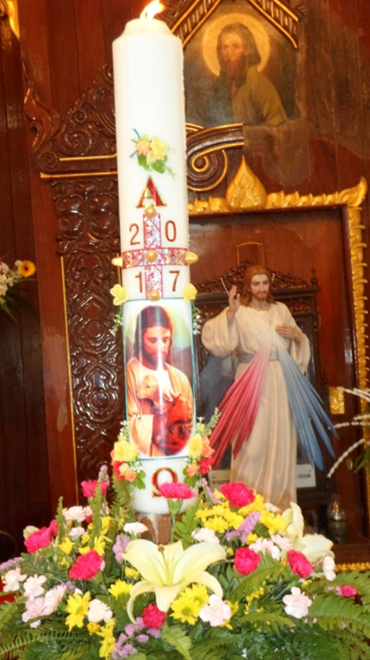 On Holy Saturday, the big Easter candle and water were blessed during mass. Finally, on Easter Sunday, the crosses in church were unveiled, the people sang jubilant songs and Christ’s resurrection was celebrated. All wished each other a Happy Easter and received from the priest an Easter egg and holy water in a bottle to take home.